"Don't say that," he cries, getting up and reaching for me. "You're everything I could ever want and more. Don’t you know that?" I shy away from him, not allowing him to pull me into the warmth of his embrace. "And do you really think I could be happy, knowing that you threw away your future on account of me? Luke, I refuse to hold you back. I want you to have everything you’ve ever dreamed of because you deserve it. That’s why I want you to tell your manager yes. You owe it to yourself, your mom…your dad…to go and play in New York.” I sigh deeply. “If you don’t, I don’t think I’d ever be able to forgive myself.” Hugging my arms to my chest, I slowly back my way out of the kitchen. But with silent tears streaming down my face, I keep going. Once I get inside my room, I lock the door before throwing myself down onto the bed, tugging the sheets around me that are still warm from his body. I am a big fan of sports romances – and I am always delighted to find one which rocks the mold a bit. Luke has recently recovered from a life threatening injury sustained in a baseball game. He is young, and his whole life has been baseball, so in spite of his fears, he needs to get back on the pitch. He is short, under-rated, and his nickname, Single, is due to his ongoing status. He is however, most definitely one of the good guys, and reading about his commitment to his ailing mother, and his father's memory adds to his stand up character. He is so conflicted due to his feelings for Roberta, and we are drawn in so effectively as the heat builds and the scene is set. Roberta is also someone with depth and strength that she hides well. But we also know she is hiding something else – and as in most cases, it becomes more and more difficult to come clean the longer she waits. She is always a good person, and we grow to understand and care for her, just as much as Luke. They really do deserve each other...how does it work? Well, get reading! 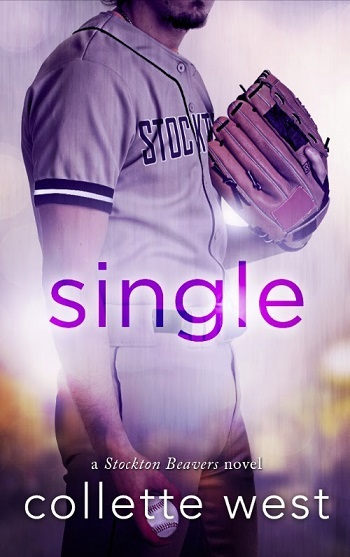 Reviewers on the Wicked Reads Review Team were provided a free copy of Single (Stockton Beavers #1) by Collette West to read and review for this tour.